For all of you girls heading to school soon (need packing tips? read this post) in order to gear up for sorority recruitment I know you're probably starting to get a little anxious. You've already done the hard part by getting into the college you're attending but if you are anything like I was you've anticipated sorority recruitment for quite some time now. Personally, I always knew I wanted to join greek life at whichever university I chose to attend and I can affirm you that yes, it is as fun as the pictures make it out to be. From getting to work with some incredible philanthropies, making friends from all over the country, have the opportunity to gain leadership positions, and have a blast doing it all getting involve in greek life has been such a rewarding experience. Those of you with first semester probably feel as though this process is the only thing you can possibly worry about let alone the fact that you will be starting college classes just as soon. 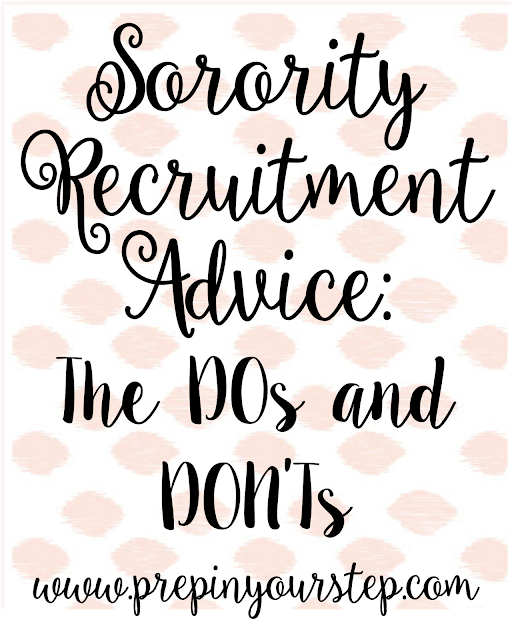 Well, I am here with some advice for the process that will hopefully calm your nerves and help lead you to discover which sorority house you most want to call home. Instead of going into detail about each one by writing out the tips I thought that it could be fun to share this advice by way of two videos. 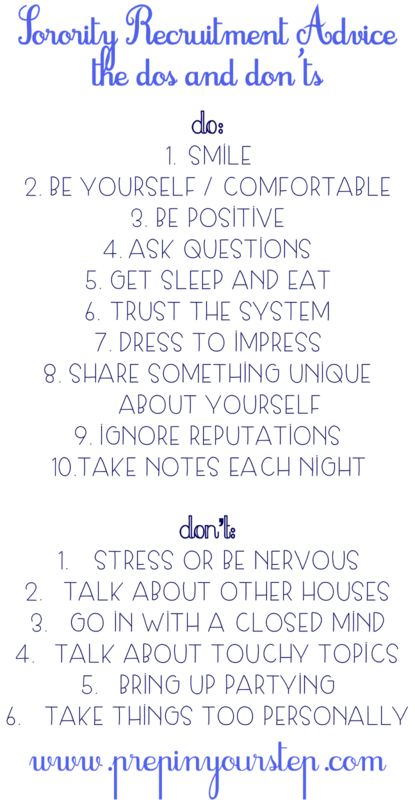 These tips are relatively self explanatory however, if you would like more insight about what I mean by each one then feel free to watch these videos to clarify! 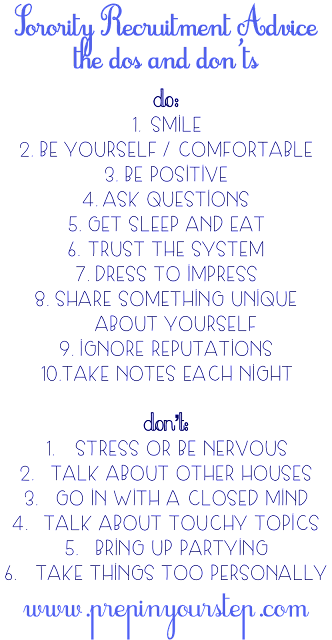 I really hope these tips helped calm the nerves of any of y'all headed off to begin recruitment in a few short weeks and that your experience during the process is just as much fun and exciting as mine was. I would love to know what sororities those of you going through recruitment end up joining! Welcome to the greek community! Thanks Dorothy for these tips! I will keep these in mind for rush in a few years! Do most people at Furman get a bid?